PROFESSIONAL QUALITY COMIC ART FOR INDEPENDENT CREATORS. We work with independent and up-and-coming creators in producing comic book art, designing new characters, script reviews, editing, mentorship & much more. From character design to sequential interior art, cover artwork and even printing, we can help you through any or all parts of the comic book production process. From fundamental story themes & concepts, cover layouts, character designs, environment visualisation, pre-press and more, we can help you bring any idea to life. 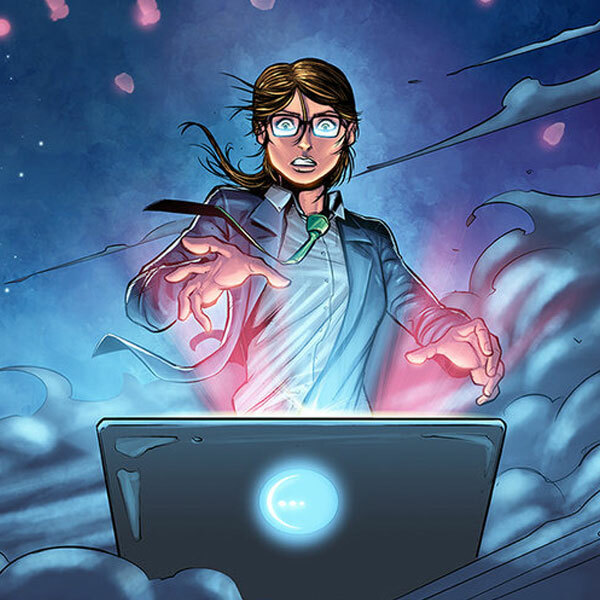 Often, your first foray into comics and storytelling need guidance and almost every writer/creator needs editing, something our in-house story editor will be happy to help with. With an infrastructure already in place, we’re able to deliver a commercial service to the independent creator with great ease. Most of us at one stage have all been independent creators and still produce indie projects, so we know the terrain well. Its often not possible to stump up the cash a brand or publisher may have access to, so we’re happy to offer monthly payment plans to deliver your artwork. Whilst we’re not able to officially attach ourselves to prospective crowdfunding projects, we can help you plan, promote and execute your campaign. As an independent creator that was new to the scene, AmCo not only delivered work that was beyond my expectations but gave great insight and advice that has proved invaluable. I’ve got the next Batman/Spider-man superhero sensation, will you draw it? Well, yes and no. We’re realists and whilst we receive many great scripts looking to do whats been done before, a unique concept is really what we’re looking for – a narrative that gets us excited, with enthralling characters and a unique selling point. But with that all said, if you think your idea has mileage, by all means send it over and we’ll take a look. In the first instance, its important we can get a grip of the overall body of work quickly. So what we look for in submissions is a the title, a log line and a less-than 500 word summary of the entire story. If you have ideas about the kind of style you think would suit the work or previously illustrated to us, please do send this too, but it is not a requirement. Will you read my full script? Once we’ve had a chance to review the 500-word synopsis and we think we can add value, yes of course! I’ve got a publisher interested and need an art team. Can you help? In short, yes. Having an editor or publisher genuinely interested is a good sign and usually pre-qualifies the material for a fast-track review by us. So by all means, do get in touch. We’re planning a crowdfunding campaign to fund the project. Will you draw it for us? As with regular submissions, please send us across your less-than-500-word breakdown along with your campaign plan and any previous campaigns you’ve run. Typically, we’ll need to provide a quote to complete the work, which can usually be offset against the overall project fee if you reach your funding goal. Will you draw my project for free? There are definitely exceptions to every rule and it definitely depends on a few things – such as your previous works, publisher platform/interest and the proposed deal structure. But typically for most work-for-hire projects, unfortunately we’re unable to accommodate such requests.